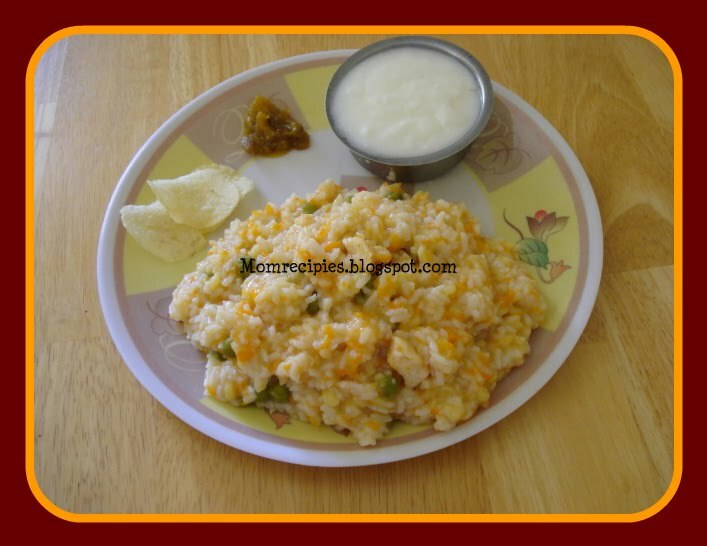 Vegetable Khichdi is the comfort meal . This is the food with full of nutritious and wholesome meal specially for infants,kids and also for the adults. Its very good for the infants and kids because its mushy type and also its easily digestible. It provides plenty of energy, nutrients and proteins to your baby.Addition of vegetables gives the khichdi great flavor and of also makes it more healthy. Also at the time of having cold and fever this khichdi works really well.I make this quite often for my daughter. Wash the rice and moong dal well. Heat up the ghee in a vessel and mix in cumin seeds and asafoetida, when the seeds crackle mix in the vegetables and stir fry for 2 minutes. Mix in rice ,dal and turmeric powder and continue to stir fry for 2 minutes. Add all the ingredients and salt with water and cook in pressure cooker for 3-4 whistles. Temper with a little ghee , cumin powder and coriander powder. Serve with pure ghee and dollops of dahi.